The tower is good, great for all the family. 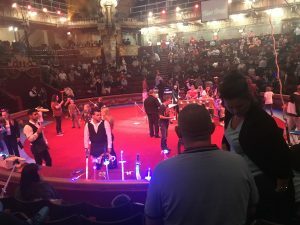 You can walk round downstairs, and have a look in the ball room (which people still use for dancing), and then you can go for some food at Harry Ramsdens. This floor also contains the entrance to the tower ‘eye’ which is where you go up the tower. Before you get to the lift to go up there is a 4D experience. Now this hasn’t changed since we last went about 3 years ago, however it is still (in my opinion) quite a good little show. It lasts probably around 5 or so minutes and contains flashing lights, confetti, bubbles and blowing air. The 3D part is really good and it’s a little video around/about Blackpool tower. This then leads to the lift which takes something like 61 seconds to get to the top of the tower. The edge of the glass floor. When you get to the top you can walk on a glass floor. This is REALLY good! 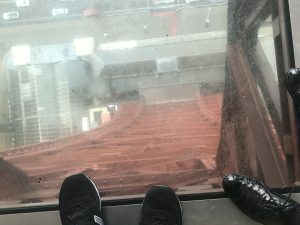 Not just the floor but also the ‘wall’ that it’s attached to is glass so you really get this feeling that you’re stood on nothing which is scary but a fun thing to do. There is another level that you can go up via some stairs, however because of the winds we were unable to go up. If you do go on a good day I would recommend going up to the top level, there are some amazing views to see! We came back down and noticed that it was nearly time for the circus. 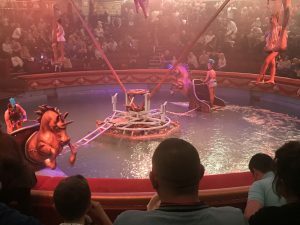 You do have to pre-book the circus and usually you’ll be given an option for times and they will ask if you want VIP seats (the front 2 rows), personally I wouldn’t bother because even if you’re sat at the back you still have a pretty amazing view because the circus arena isn’t big. We went down to the queuing system and walked through to what used to be the doors to the arena, however now they lead to another little queuing system. This new section is actually really nice with decorated walls, mosaics and decorated mirrors. You can tell that it’s all new, but you also get to see Mookey through the years (Mookey is the Blackpool Circus Clown and has always been the Blackpool Circus Clown). The circus lasts around 2 hours, and has an interval in the middle. All of the acts are fantastic and it is all very family friendly. Like I have said we go just the two of us and we love it so don’t think you need to have children with you to go. PRE WARNING: if you choose to sit on the edge of the row you may be chosen to participate with Mookey or his ‘brother’ Boo, this doesn’t involve leaving your seat but more they will have a little chat with you or tell you a joke. All in all I love the circus!! It is one of my favourite places and it gets even better at Christmas time so we will definitely be going back!! Just before the start of the Circus! The very end they fill the floor with water :D! To end our day we then went to the Blackpool Tower Dungeon. I HATE anything scary but Martin likes it (of course he didn’t get picked on to participate in one of the rooms). If you do not like joining in then do not go. The will literally pick on anyone and you can be picked more than once!! You’re never made to do anything you can’t do, it is usually just sitting somewhere or standing so that they can do a demonstration, and you will never be harmed. I got chosen to join in, in court where I was accused of being a witch and ‘doing the nudey dance to attract the men, with all of my wobbly bits out’. This was hard to respond to but if you plead guilty then you get away with it anyway. Even being picked out (which I didn’t want) it is still a lot of fun. There are several rooms and it takes around an hour to complete, you do go round in a group with lots of other people, however if you try and hide then they will notice you. There is also a ride at the end which you can choose to ride if you wish but you do not have to, we opt out every time. 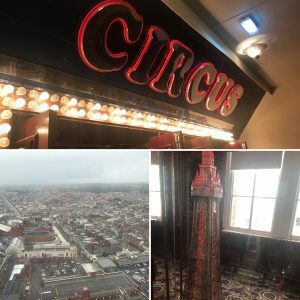 There is PLENTY of things to do in Blackpool and you can have so so so much fun as a family or a couple or on your own. However if you do go, I recommend having a look online at prices and see if you can get a discount code first, and plan your day so you can do as much as possible. If you wish to see more of our photos then head over to our Instagram! These are not the only things to do in Blackpool, there is also; Sealife centre, Madame Tussauds, Pleasure Beach, arcades and more. If you do go and come across anything that we haven’t mentioned or anything that you particularly enjoyed then please let us know, we would love to hear what you got up to in Blackpool!! Previous Previous post: Buying a Merlin Annual Pass.